LIVE broadcast from Kall, with the entire crew! At the beginning of this month we introduced many great improvements to our station, such as: a new international Saturday schedule, the arrival of Mi Amigo legend Peter van Dam and a new improved 192k high quality web stream. 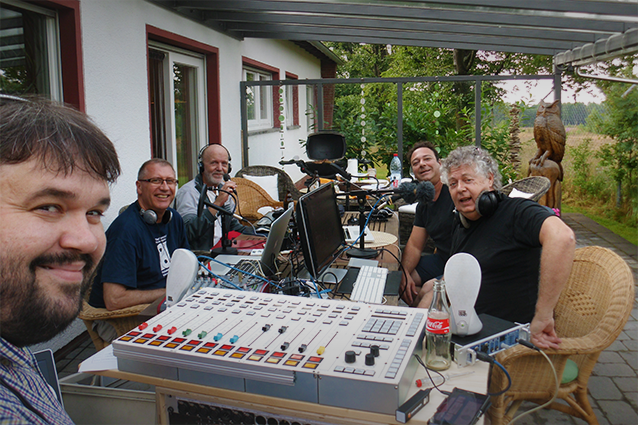 To celebrate this new chapter in our history at the start of our new summer season, our entire crew of DJ's and technical staff a will all meet at our Short Wave Transmission Centre in beautiful Kall-Krekel, Germany for a group BBQ and a 3 hour live broadcast to Europe and the world! 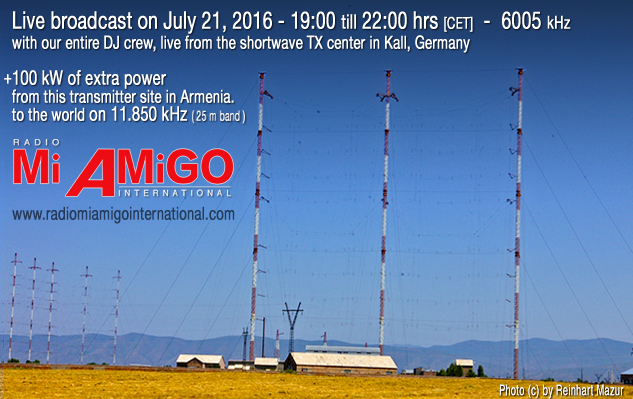 For this special occasion we will not only broadcast on our regular European 6005 kHz (49m band) and the 1485 AM (from Riga), but this live show will also be relayed to the world by a 100 kW short wave transmitter in Armenia, on 11.850 kHz (25m band)! This powerful 100kW transmitter has 12 different directional antenna configurations and will be able to reach parts of the world outside Europe where normally we are not received. So we intent to properly introduce ourselves and the station to all the new listeners worldwide. The 3 hour show will feature reports and details about the unique vintage Shortwave Broadcast Centre in Kall, our transmitters, the buildings and antenna's. We'll talk about today's Free Radio and our station -where we come from and our big plans for the nearby future- and we'll introduce everyone in our excellent team. Our DJ's will tell stories -and answer questions- about their time on the glorious radio ships and play some of their special favourite records. It will be a fun night, a real get-together of our AM radio loving international DJ's and our listeners. The broadcast will be mainly in English with some Dutch, German and French as well. The music will also bring back some wonderful Free Radio memories. Listeners can participate in a number of ways: live via email: studio@radiomiamigo.international and/or chat live via this special event page on Facebook (where we will post pictures and movies). You may even call in live via Skype [click here for call] with questions, greetings and/or requests. Everyone who makes contact with us that evening will receive a special QSL card. And if you enjoy Radio Mi Amigo for its great music, you may also listen on-line in HQ stereo via our brilliant new web stream. So we hope you enjoyed the show as much as we did, in case you missed it or want to hear it again, the shows' archive is here: Thursday July 21, 19:00 till 22:00 hrs on 6005 kHz and 11.850 kHz.